Before airports became shopping centres with runways, Airport Lounges were sanctuaries away from rowdy kids, distressed passengers, and fast food outlets. Now sometimes, you’re not sure whether it is more comfortable outside the lounge than inside. That’s certainly the case at Kingsford Smith International terminal Qantas Business Class lounge, on a heaving Sunday morning. 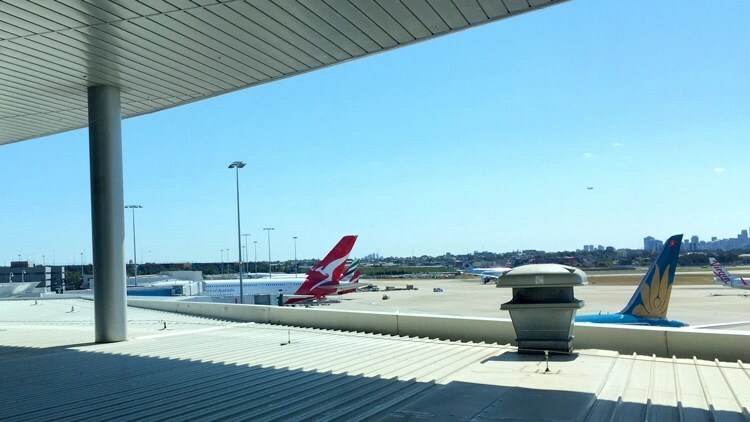 We arrived at Sydney’s international airport a little after 9:30 am for our 11:45 Qantas/Fiji Airways flight. We were running a bit late (curse the automatic watering system and its random settings – a story for another time), and were nursing slight hang-overs from the previous night of Mahjong. We could tell the airport was going to be heaving from the traffic queue up to the departures area. Our Uber driver was canny, and avoided most of the chaos, depositing us about three quarters the way along the terminal. We checked the departures screens and realised we needed to backtrack to check-in desks E19 to 24. 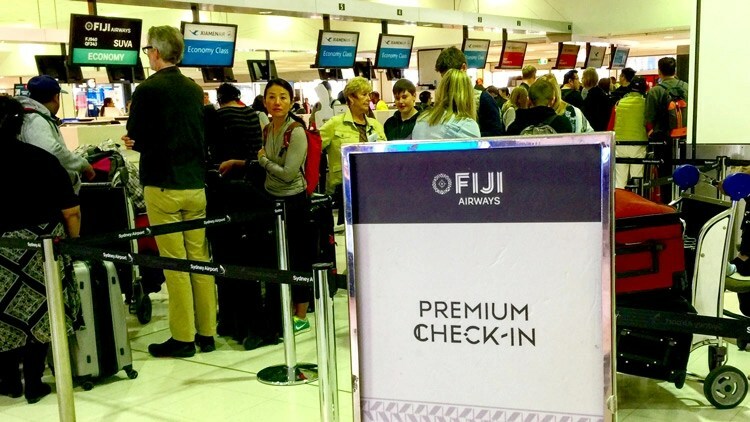 We asked a Fiji attired assistant and were told the Suva check-in desk wasn’t opened yet. As we turned around to negotiate our selves out of the crowd control lanes, we noticed something over at the F counter. That’s better. Wrong counter and row, but right flight and destination. I love the new Fiji Airways branding – particularly their aqua and brown colouring, and the custom fonts and themes they use. Our check-in bags were weighed and stuck with priority stickers, and our hand luggage tagged with ‘cabin approved’ tags as well (I don’t really understand why they do that – can anyone explain?). We were warned about the distance gate 53 was from the lounge, and to allow 10 minutes to get there. With our tickets and express immigration passes in hand – off we went. All the desks used to fill-in your immigration forms were denuded of forms. A staff member confirmed that outgoing immigration cards are no longer used. I wonder about the advantage of express passes, now that immigration consists of scanning your passport, but when the airport is this busy, those express cards come into their own. The queues were a lot shorter at the express counters both for passport and security scanning. We were directed to the full body scan queue, as were most passing through security at that time. Still, despite that the process was efficient, and we were soon into the jungle of duty-free shopping (such a misnomer – it’s not a duty, and it’s not free!). We had a few essential purchases and were soon on our way towards the escalators that lead to the two Qantas lounges. 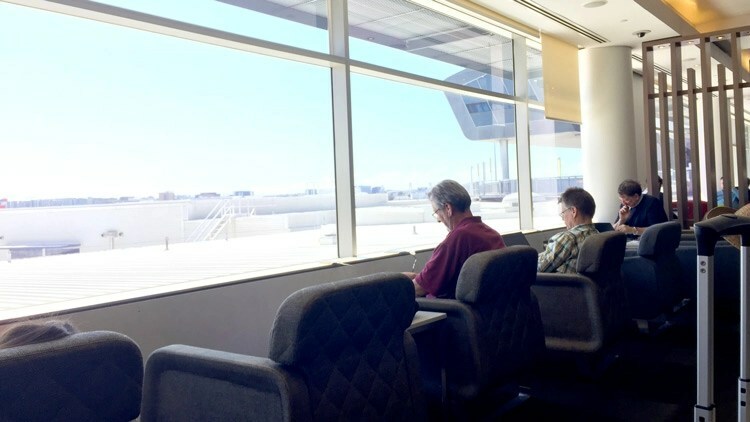 Unfortunately, this time we had to pass the hexagon patterned sandblasted doors of Qantas First Class lounge, and head to the Business Lounge. 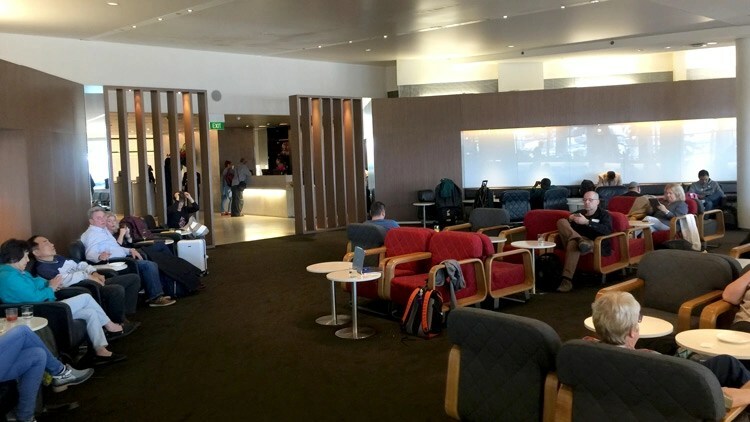 The Lounge – Qantas or Fiji Airways ticket? At the reception desk, the staff had to manually check our Fiji branded tickets against a printed list (our tickets had been purchased from Qantas with a Qantas code-share flight number). 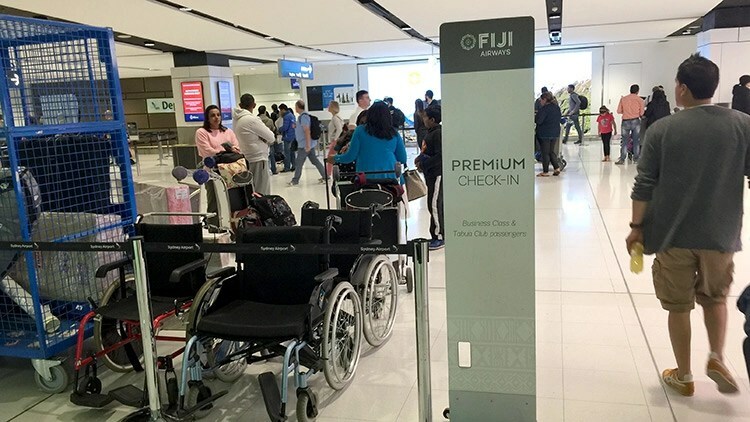 The check was needed as the staff member explained to determine who paid for our lounge entry – Qantas or Fiji Airways. In these days of big data, you would just think this would be sorted out at the IT end. 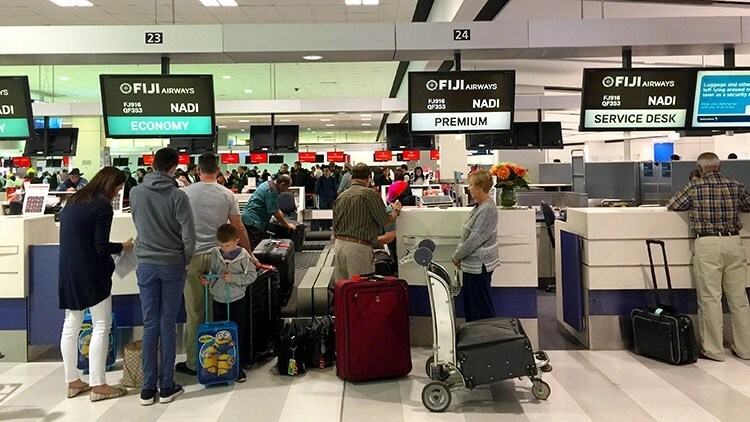 The staff member shared our incredulity and explained that her first task at 5 am when she started her shift, was to refuse entry to a passenger who had purchased their fair direct through Fiji Airways and was therefore not eligible for entry. The lounge is pretty much as it has been for a few years. The internal foyer that used to be pretty furniture free, is now populated by Marc Newson designed lounge chairs. They seem to have removed a lot of the shelved room dividers with vertically louvered ones. This gives the space a more open feel but makes it less intimate and more barn-like. I may be mistaken, but it also feels like they have removed some of the more permanent furniture that provided side table space and power points. There used to be a kids area up the back, but this seems to have gone as well. The lounge was pretty full – I mean at least one in every two seats was occupied, so it was quite hard to find two seats together to occupy. 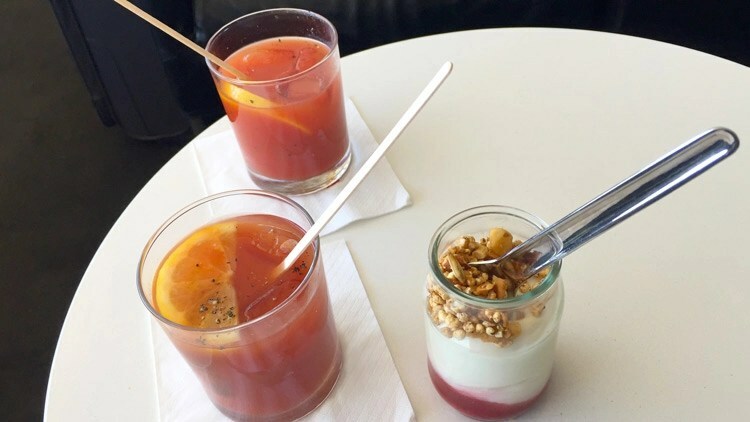 We opted to start our visit with self-made bloody mary’s – the correct drink to start a journey! The healthy part was the yoghurt with fruit syrup and chopped nuts. There were quite a few coffee stations – but all unstaffed. Maybe we were too late? 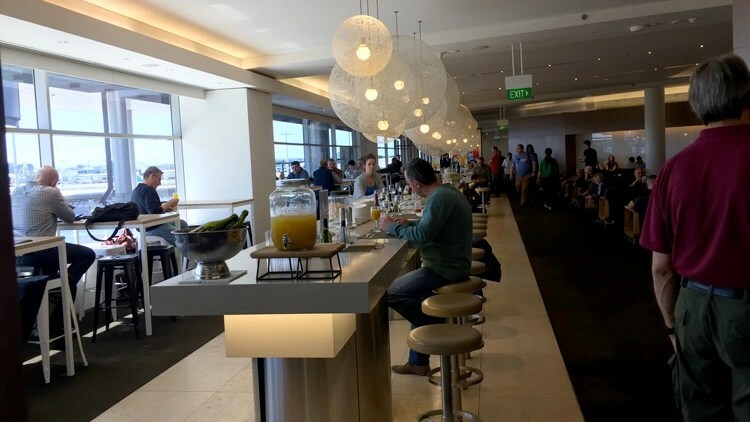 In fact, throughout our stay in the lounge, staff were progressively changing the food stations from breakfast to lunch – shutting one station at a time and restocking. I tried to take photos, but there were too many people to get many, and when things thinned out a bit – they were transitioning to lunch. 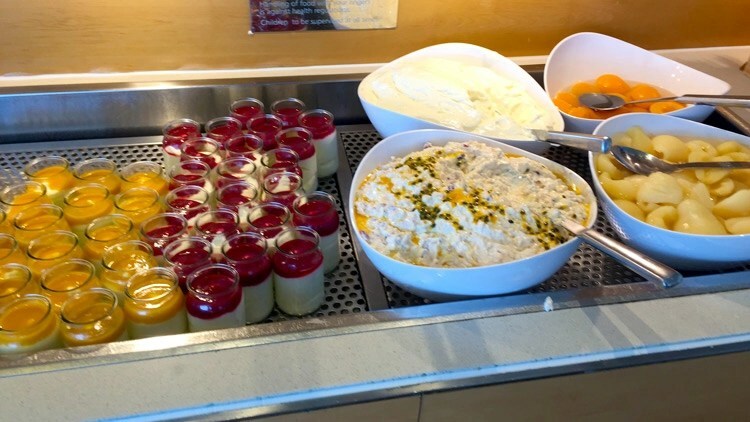 Above – fruit salad, yoghurt pots and bircher muesli. There was also a hot selection comprising the standard scrambled eggs, pork sausages, bacon and baked beans, plus self-serve coffee machine, and toasting station. 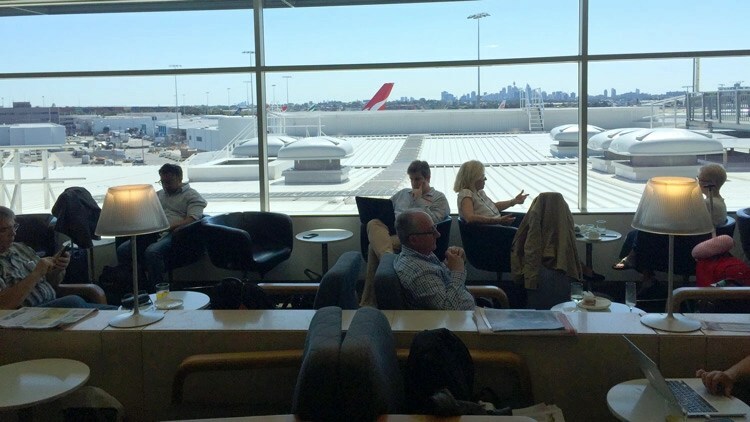 That spaceship like appendage in the upper right side of the above image is part of the Qantas First Class Lounge. The once mainly vacant internal foyer – now full of Mark Newson designed lounge chairs. 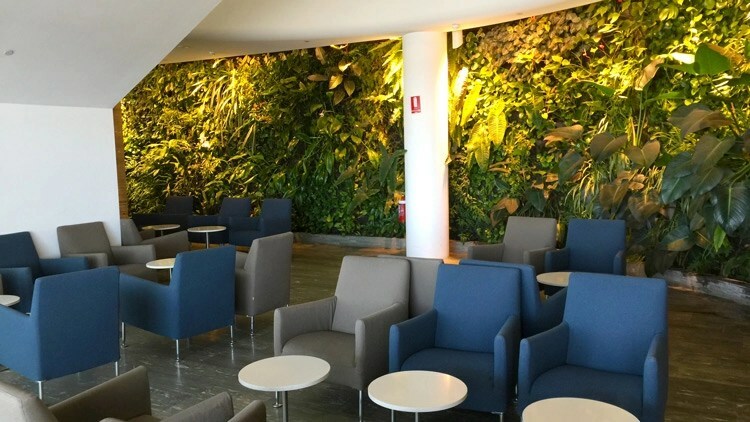 Right at the end of the lounge was a small space – under the stairs, which looked like an overflow area with a living wall, chairs and tables and no one there. There was one guy in the lounge who succeeded in looking like a real wanker. Even I couldn’t sink to publishing a photo of him. He was ‘pinching the air’ to navigate his imaginary 3D world. He was wearing Virtual Reality glasses. The first impression was that this was extremely cool until you realised, that he had to keep retreating to his touch screen to actually achieve anything. If this is this the future – we will be faced with rooms full of people looking like they are dancing to their own tune. 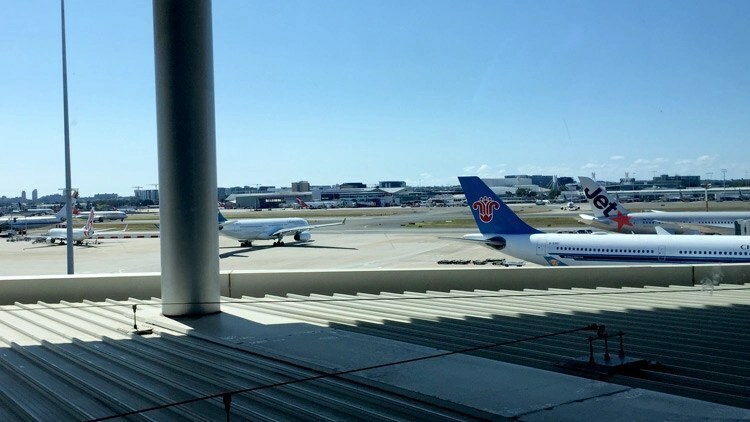 While we were waiting in the lounge a large islander delegation arrived, along with several Australian Federal Police, or Border Force Officers (who can tell the difference these days since they both wear dark blue uniforms with Australian Insigniers). I tell you this, as the Officer(s) then just stood around, while the delegation fed and watered itself. The officer(s) looked like the proverbial shag on a rock. We had been advised at check-in that boarding would commence an hour before the flight at 10:45 am – which seemed a bit soon, but on the departures board, the boarding time was listed as starting at 11:15. We left the lounge about 11:10, and made our way through the shopping obstacle course, arriving at the gate about 11:20. What used to be a fairly plain corridor with moving walkways, now looks like it hosts the longest McDonalds Cafe in the world sporting a paper plane theme. Boarding had not commenced when we arrived and didn’t start for another 10 minutes. The Qantas Business Lounge could do with a lot more powerpoints, and a design which made the space feel more intimate. Food and beverage selection is good for a lounge of this nature, but it would be improved if coffee stations operated on Sunday up until roughly midday.